For five years, The Bascom Winter Resident Artist Program (W.R.A.P.) has called upon faculty and students from the surrounding universities to submit site-specific installation proposals for its beautiful Loft Gallery. The W.R.A.P. is designed to accommodate the winter break schedules of artists enrolled in degree programs or those in higher education instruction. The benefits of these partnerships are twofold as they provide emerging and established artists opportunities to display their work, and bring new, thought-provoking arts experiences to the community. A record number of applicants submitted proposals for this year’s residency leading to the first collaborative installation, as well as the first student-faculty collaboration in The Bascom’s history. 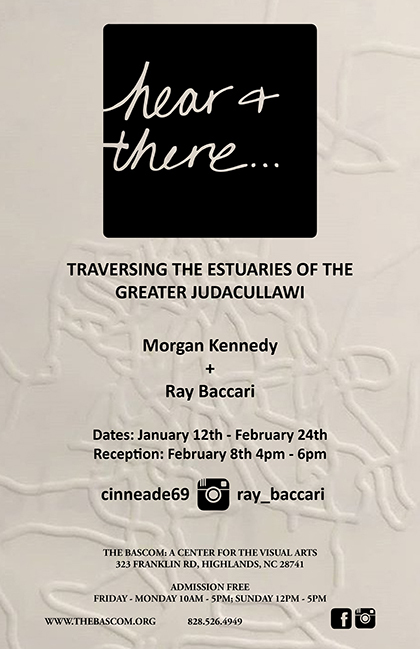 We are excited about the work of artists Ray Baccari and Morgan Kennedy, Professor of Western Carolina University and can’t wait to present here + there!